All data in this article was taken from leader board and public user profiles. All the statistics and opinions in this article have NO official character, being made on request of competitors, and from the author’s own/personal interpretation. First at all you must know that all results obtained in Round 1 are not relevant to the Round 2. This year section was marked by the new site for hosting the competition. A new element has its own weaknesses and that we can deal only through collaboration, communication and feedback. Started in September, Round 1 was one of the most comprehensive comparing with previous years. Also, the competition format was changed from one hour at a specific date to 24 hours format, allowing students from around the world to compete at the times most suitable for them. This change, including more generalist format of questions, the period of time for holding the round I, resulted in qualitatively better results this year. We mention that there were two scores close to maximum (29) but we have not had the joy of achieving the maximum score (30 points). Competitors qualified in Round 2: ~1475!!! Total attempts: more than 8400! From my point of view, the greatest competitors were all who manage to compete in almost all quizzes. There were 4 competitors that participates in all quizzes and 18 of them participating in 7 quizzes. This is the table of honor for Round 1 (all of them with 8 presences). Really great performance for all of them. Sum of scores is an indicator that measures the strength of the competitor’s involved and them combativeness. Average scores is an indicator of quality that can fairly accurately measure the knowledge level of competitor. Average score is directly proportional to the sum of the scores obtained. 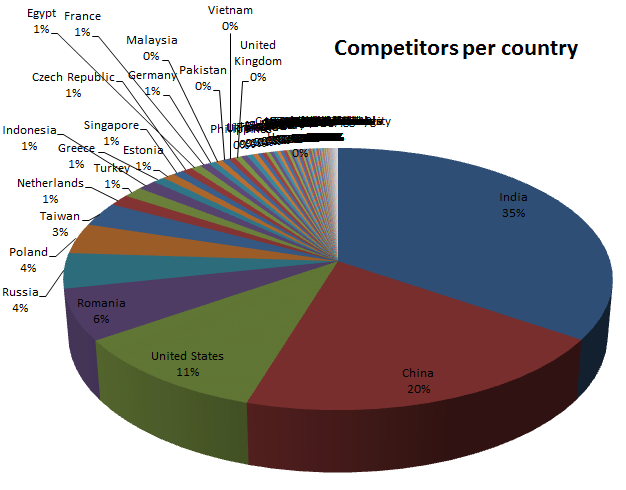 IT Challenge is not per-Country competition, but year by year students around the world are asking about them country Rank in total of competitors country. It is just for Fun! Next table is generated by number of competitors per country (Top 20) and ordered by number of qualifiers in Round 2. The top is the same like in previous years, except Brazil… usually in this top. Top 20 as number of competitors, ordered by number of qualifiers. Soon we will come with Learning references for Round 2. Stay tuned on our Forum and Facebook page. See you in Round 2.